To all Carly Rae Jepsen's fans, sorry to break your hearts, Concert Republic regrets to announce that CARLY RAE JEPSEN’s concert in Manila on August 12, 2015 will be rescheduled. This is due to the recent typhoon that has also affected Carly Rae’s other Asian show dates. Therefore, a collective decision was made by the artist’s management to reschedule her show in the Philippines. This will also coincide with Carly Rae’s recently announced appearance at the MTV World Stage Malaysia 2015 on September 12, 2015. 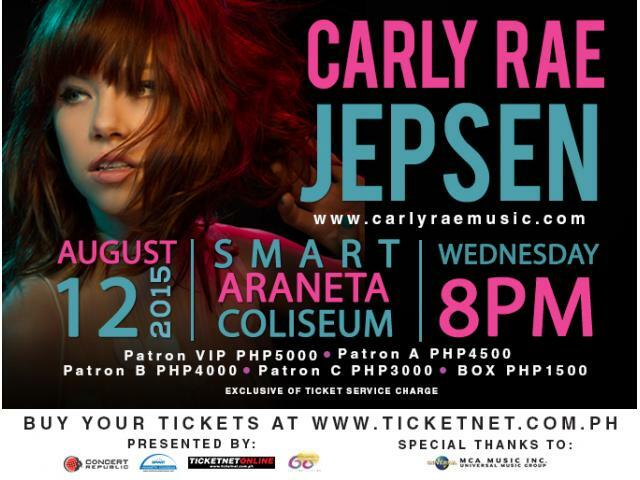 CARLY RAE JEPSEN LIVE IN MANILA will happen on September 14, 2015 at the Smart Araneta Coliseum, Quezon City.